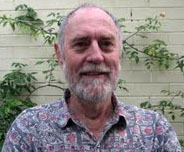 John Pinniger has been involved in Permaculture for about 30 years and was the founding convenor of Permaculture Melbourne. In the early 1990s he became involved in the conservation of old varieties of fruit trees and grows what he can fit onto a small block in the northern suburbs. A member of the Heritage Fruits Society committee, he currently runs the monthly working bees at Petty’s Orchard. 1. The Heritage Fruits Society. History of Heritage Fruits in Victoria\Melbourne. The current scene, future plans, how you can become involved, and local actions. 2. Heritage Apples and apple tasting. Apples in Australia. What to grow in your backyard/community orchard. Choice of rootstocks. Pollination. Taste a variety of apples (Feb-Apr only). 3. Grafting workshop. Learn the basics of grafting, what to graft to what, and why. Safety measures. 4. Design of small food gardens. Simple, cheap and effective plants for healthy eating – where and what to plant in your backyard.